A whole load from Me & My Big Ideas! Box kits, paper stacks and heaps and heaps of embellies! Basic Grey's Nook & Pantry - patterned papers and paper doilies. Making Memories' Vintage Findings Collection - patterned papers and uniquely different embellies! Iris' classes are slowly filling up so if you haven't already, make sure you do quickly to avoid disappointment! The time has come and I know many of you have been anxiously waiting for us. We can't thank you enough for being ever so patient!! The idea of inviting Iris came to us about six months ago and seeing it all slowly come together gets us all excited everytime! Hailing from the Philippines, Iris is one of several designers from this region whose creations never fail to grace popular scrapbooking magazines such as Memory Makers, Creating Keepsakes and Scrapbook Trends, among many others. Iris is also a designer for manufacturers such as Prima, Websters Pages and October Afternoon and she makes it seem like an effortless task as she juggles her time between taking care of her family and meeting scrapbooking deadlines! 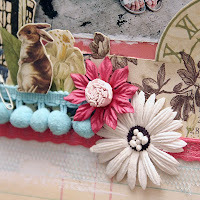 We are well and truly grateful that Iris has created 4 never-seen-before layouts to be taught exclusively at Shabby Chic which incorporates so many amazing techniques that always makes her work so uniquely beautiful. For one weekend only, this would be your ONLY perfect opportunity to learn directly from Iris how she creates such amazing layouts all the time!! 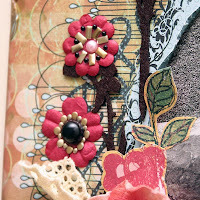 Blossom - This class will teach students how to use gesso for coverage and for distressing. We will also be working with melted gold wax and tulle. Plus there will be lots of hand-cutting, tearing and wrinkling! 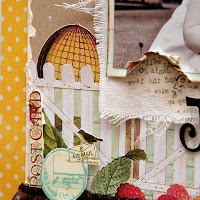 If you like the shabby chic style then you will enjoy this class! Sweet Days - Who said canvas was only beautiful for painting? It is a beautiful base for scrapbook pages too. In this class, you will learn how to prep canvas and use it as a prep for your layout. We will play with paint, gel medium, perfect pearls and you will use gloss varnish. Loved - Have you ever looked at a painting and wondered how the artist created the texture and embossed images? You will try your hand at being an artist in this class. We will work with modeling paste complete with a palette knife! Then we will create beautiful colours on our page with metallic pigment powders. Journey Called Life - This class will focus on using gel mediums for print transfers and creating textured edges. We will work on both paper and canvas. If you are the artsy type or if you have wanted to try playing with artist mediums then this is the class for you! Note : Both classes are of intermediate/advance level. We're giving away goodiebags worth B$50.00 for the FIRST 8 students who signs up for BOTH classes!! And that's not all - there will be heaps of giveaways during both classes and we're talking NICE, really NICE goodies :) Don't miss out on this wonderful chance to learn, win and most of all - HAVE A BLAST!! REGISTRATION IS OPEN NOW!!!! SIGN UP TODAY!!!! 1. Fees must be paid strictly in CASH ONLY and are NON-REFUNDABLE. NUR AMANINA SYAIRAH HJ HASNANI!!! You're our lucky winner this week! But don't give up, everyone :) There's more to come and here's the prize of our next draw!! The third Weekly Draw has started today and the prize includes a Pink Corduroy Album from AC!!!!! Woohoooo! We just realised it's already 3.15pm (sorry!) and we have a winner for our first draw! And to everyone else, don't feel disheartened! Remember, this is a weekly draw so drop in your receipt (for minimum purchases of B$50 and over) and you could be our lucky winner of nice goodies (picture below) next week!! More of the summer's collections are up on our shelves now!! Fancy Pants, Sassafras Lass, Crate Paper, Basic Grey, KI Memories, Northridge magazines and Websters Pages. Here's a peak at them and I must say, Websters Pages have done it again with their beautiful papers which we just can't seem to get enough of. More of their alpha stickers - grab yours quick! You understand, right?? They're GORGEOUS!!! Fancy Pants - Ribbons, double-sided patterned paper, transparencies and rub-ons. And now for some EXCITING NEWS!!! In our run-up towards our 3rd anniversary in November, we're running WEEKLY DRAWS for really delicious scrapping goodies from AMERICAN CRAFTS!! Beginning October 1, stand a chance to win scrapping goodies from American Crafts worth over B$100 with a minimum purchase of B$50 in a single receipt!! And here is what you can win in this week's draw! The first draw closes on 7 October, 2009 and the winner will be announced the following day at 3pm. So what are you waiting for?!! Over 5 weekly draws awaits you!!! HAPPY SCRAPPING AND GOOD LUCK!!! - A minimum purchase of B$50 in a single receipt is required to enter the draw. - Receipts that are not drawn cannot be carried forward to any following draws. - Shabby Chic reserves the right to amend any rules or regulations of the draw without prior notice.